James Beard awards celebrates cocktails! The list is finally out! Every year, the James Beard Foundation recognizes excellence in the food industry. But this year, this is an exiting new addition: This is the first year the James Beard Foundation is recognizing outstanding bar programs. Campari is sponsoring the new award category, which recognizes excellence in wine, spirits, and beer. It's a welcome addition to the awards program, in my mind. The surge of interest in the so-called craft cocktails have brought an exciting new standard for the quality of drinks—and the places that have pushed this bar the most (so to speak, ha!) definitely deserve recognition. Few of these semi-finalists deserve to call out here. 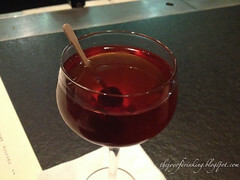 Though I have never been to the Aviary, they are making huge contributions to how people think about crafting cocktails. The question they ask is, would you let one chef make one dish all on his own? The answer would be no. And so they take a line kitchen approach to making drinks, with a whole slew of folks in back creating the drinks. (Now this is one occasion in which you really do question the use of the label "bartender." :-) Mixologists, it is?) It points the drink industry in a new direction, if the venture is successful—and judging by this nomination it has been successful. To my mind, I would miss sitting behind an old wood bar and actually talking to the person making my drink. It's an indulgence, perhaps, but one that admittedly makes my drink taste better. This place is widely recognized across San Francisco as a true labor of love. The great pains that Thad Volger, the gentlemen who started it all, has seemed to reach mythological proportions. People were worried he would die starting the spot. But in the end, it seems his efforts paid off. 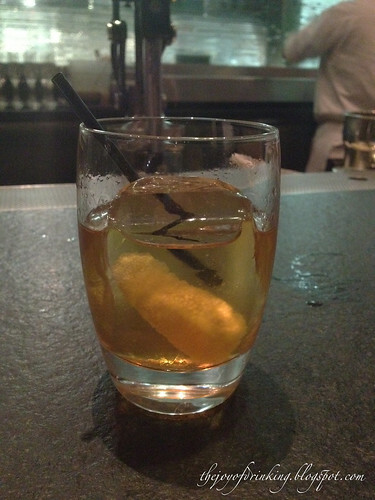 Hats go off across this city for the incredibly high quality of ingredients at Bar Agricole. And Mr. Volger's co-founder, Eric Jackson, is an incredible bartender as well. We've had the pleasure of sitting at his bar at both Heaven's Dog and Bar Agricole, and the man can shake up some serious magic. Josh and I have incredible reverence for The Violet Hour and for the integrity with which it makes its drinks. A New-York-style speakeasy in Chicago, the bar is commonly described as an "Alice in Wonderland"-like place. It takes you to another world. Tall, majestic curtains muffle loud, offending sounds, and the world becomes more intimate. You can talk easily without raising your voice. And the drinks—oh, the drinks!—are beautifully crafted. There are seven different types of very hard, very cold ice, and many of the drinks draw on house-made components—house bitters and house syrups make common appearances, making it difficult to recreate anything vaguely imitating what you experience at the Violet Hour. Josh and I will forever remember this place as one of the bars that first inspired us. It's also worthwhile mentioning that this is the Alchemy Consulting's second bar program on the James Beard Foundation's list. Toby Maloney, the New York mastermind behind the Violet Hour, later left to create Alchemy Consulting with Troy (one of the great bartenders from The Violet Hour) and others. James Beard semi-finalist The Catbird is one of those consulting projects. Beretta is one of the quintessential San Francisco spots—delicious Italian-American fare, a California-fancy-cantine atmosphere, and a restaurant-bar program with cocktails that feature bright citrus shaken drinks and deep, cherry stirred drinks. Bright, tasty, airy—everything you'd want out of a San Francisco bar. From what I understand, Beretta has made significant contributions to the SF bar scene, even apart from everything we enjoy about it today. Apparently, after a group of bartenders were inspired at the Tenderloin's Bourbon and Branch, some of them headed over and continued the magic at Beretta. 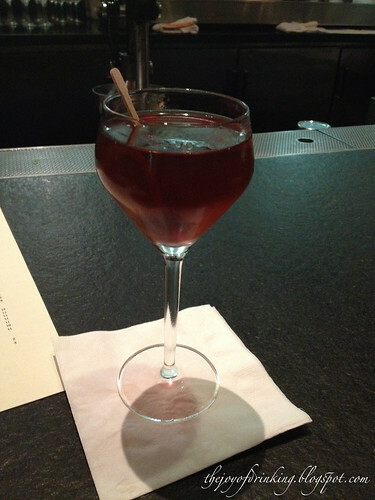 It combines some of the fun aspects of drinking cocktails—the ability to enjoy the present and the present history. PDT has been very meaningful for me personally on this cocktail journey—Don, one of the main guys behind PDT originally, was hugely instrumental in me learning about the world of cocktails. He blew my mind by first showing me all the classics. I was taken. Aside from that, PDT is one of these coolest spots I've ever been to. The New York speakeasy invites people into the bar by way of an old-fashioned phonebooth. Pick up the phone and press the button, and a voice will magically appear on the other end and usher you in for gorgeous cocktails of classic genealogy, including the super popular Benton's Old Fashioned (which is code for a bacon Bourbon cocktail!). Again, I applaud the James Beard Foundation for this new category, and I hope that the future brings with it individual recognition for the many men and women who mix amazing things behind the bar. Until then, we wait excitedly to see who will be recognized this year. I should pause and note that this picture is actually somewhat significant. For big fans of The Slanted Door—and bar manager extraordinaire Erik Adkins, for that matter—there is a new drink on the cocktail menu. 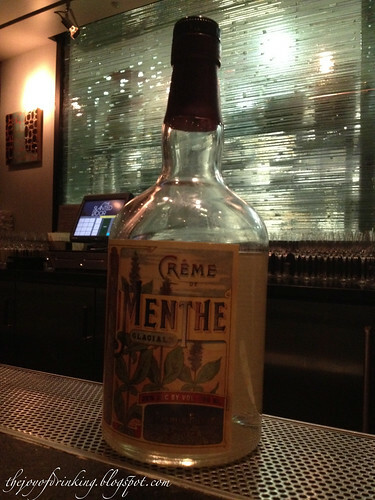 Check out the Brandy Lift—brandy, orgeat, Benedictine, cream, and seltzer. I haven't tried it myself yet. But it looks awfully delicious. Yes, I just gave you an excuse to enjoy yourself. You're welcome. ;-) Enjoy! P.S. The Classico Negroni is the way to go! I already know Josh takes issue with this because he loves everything and anything Campari. But for those who find it too overwhemingly bitter for their tastes, you will find a new way to love the Negroni with the Gran Classico Bitters. Try it, and tell us how you like it! 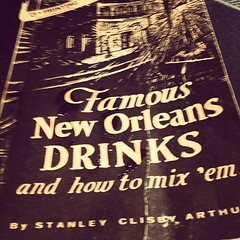 In other words, the bar will serve lots of New Orleans style stirred drinks. 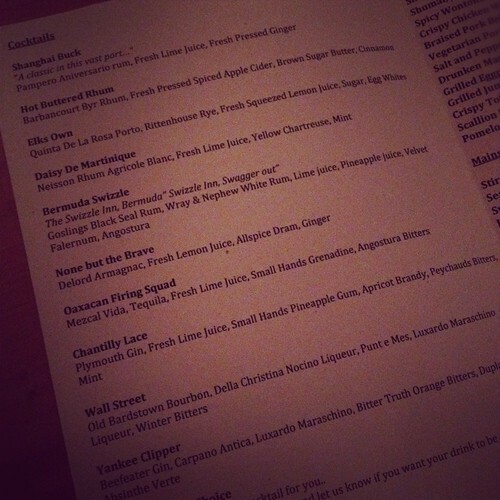 We asked to sample and a few drinks of that style, and, holy moly, are we excited for this place to open up. Stir stir stir, garnish with Luxardo Cherry. 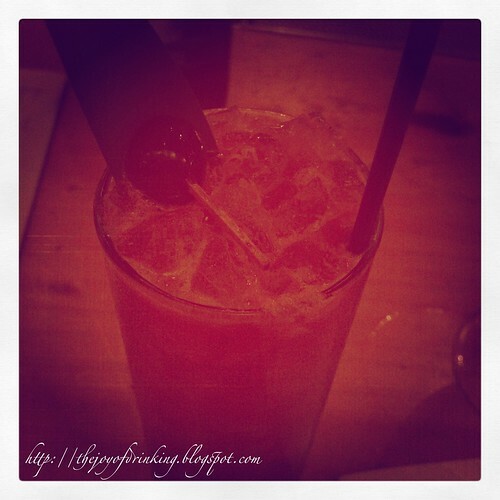 I loved this drink. It was quite rich, syrupy and sweet as it first hits your tongue. Once the benedictine passes, though, the herbs from the vermouth and absinthe kick in, leaving a strong finish of rye and a lingering taste of herbs. This is a very rich, slow drink. Order it if you want to sit and enjoy the conversation for awhile, not if you're in a rush. It's best enjoyed slowly. Learning about Charles Phan's and Erik Adkin's new Embarcadero restaurant had the curious effect of making Josh and me very excited and very thirsty. And so we found ourselves, only moments later, dashing down to The Slanted Door, one of Mr. Phan's and Mr. Adkin's tried, true, and institutionalized restaurants in the Ferry Building. After all, we wanted to end the three-day weekend on a celebratory mood. And as it happened, Mr. Adkins was there that night behind the bar! He shared with us a little more about the new spot, which is set to open just a little ways down from The Slanted Door at Pier 3. The new restaurant will take on a New Orleans flare in fare and in cocktails. 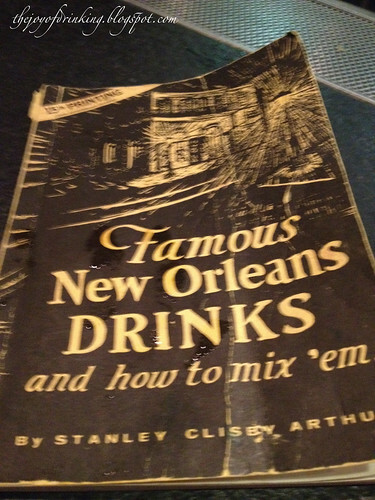 The drinks, specifically, will draw inspiration from the the book Famous New Orleans Drinks and How to Mix 'Em, an artifact from the '30s and one of the few pieces documenting drinks from that place. For Erik, that means being able to do a lot of what he enjoys—stirred drinks and the like. It's a very neat direction to go. New Orleans drinks are celebrated for some very significant contributions to the cocktail menu—the Sazerac and the Ramos Gin Fizz, just to name a few. But I don't know of very many bars who have chosen to thematically embrace New Orleans. And with the growing number of New York-style, Charles Baker, tiki, and tequila spots, it seems that Phan and Adkins might carve out a very unique spot. The new place won't be solely about the cocktails and actually the cocktail menu won't be "seasonal," as I had previously thought. 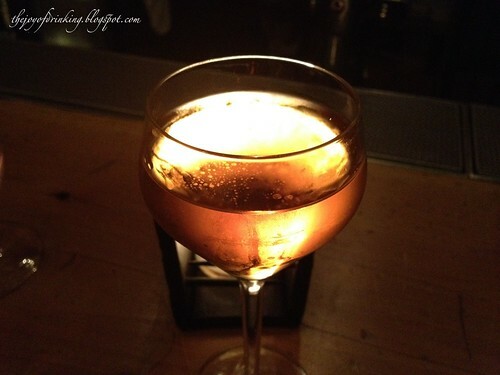 Instead, we are encouraged by with what we know about Mr. Phan's other spots—both great food and great drink. There's not much not to complain about that. And so we wait with more anticipation! 2012 will, indeed, be a very good year. Holy moly! San Francisco cocktail world, rejoice! We're about to witness a supernova. Earlier I had mentioned that the super fantastic Erik Adkins was stepping back from managing the cocktail menu at Heaven's Dog to usher in the super talented Trevor, formerly of Rickhouse. And now I'm wondering whether it has anything to do with this happy piece of news: Charles Phan (famous proprietor of Slanted Door, Wu Hing General Store, Out the Door, and Heaven's Dog) is opening a new spot on Pier 3 on The Embarcadero—and the restaurant and its food are all centered around Erik's drinks, as Eater SF reports! Details are few, but the restaurant is set to feature Creole food to compliment a "creative seasonal cocktail program," describes Eater SF. One of the distinguishing marks of San Francisco cocktail culture is that much of it is invested in food establishments. Restaurants, it seems, have an easier time acquiring liquor licenses or taking over places that already have them, and so you have a frequent interplay between food and cocktails. But I am incredibly excited to see what happens when cocktails take centerstage, and the food follows—and led by one of the most awesome bartenders. It's going to be a great year for cocktails. It was a kind of spur-of-the-moment decision on Valentine's. Though we had planned a classy, classy home Valentine’s dinner, Josh and I decided to capitalize on a celebratory mood and dash out for a quick happy hour. After all, one of our favorite bars, Heaven’s Dog, was not so very far away—and Valentine’s Day comes only but once a year! With hurried justification, we threw on our jackets and headed right over. Josh and I have been going to the SOMA spot ever since it opened in 2009. Opened by Charles Phan of Slanted Door fame, the restaurant features some kind of Chinese American fare—fancy xiaolongbao, onion pancakes, spicy dumplings, and other “high-end” stir-frys. But what keeps us coming back are the cocktails. Originally managed by the incredible Erik Adkins—who is not only super talented but also the nicest guy in the world—the cocktails always took on his attention to detail, refined classics with high-quality ingredients. We recently learned that Trevor, former bar manager of Rickhouse, has since moved over to Heaven’s Dog, which is great since Rickhouse is another city favorite. 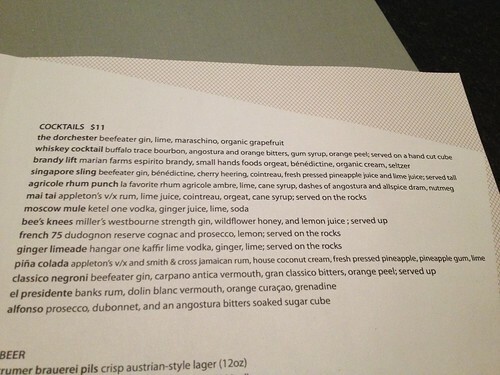 We noticed that Trevor had made a new cocktail menu. Looks yum! 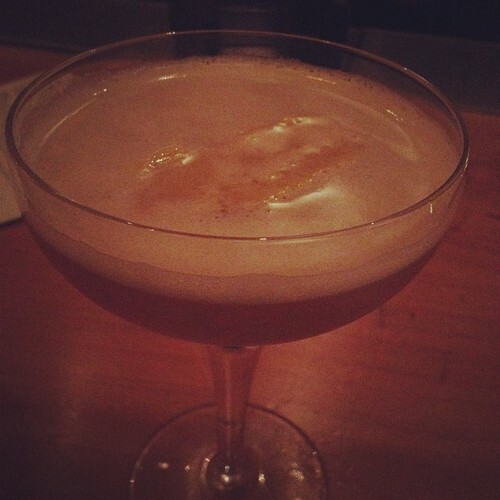 I started with a Nothing But the Brave, a stiff cocktail featuring armagnac, lemon juice, All Spice, and Ginger. We ended our happy our by splitting a Yankee Clipper, a crisp way to end our happy hour with Beefeater gin, carpano antica, Luxardo, orange bitters, and absinthe.